The incredible TRUE STORY behind the iconic photograph, taken at the liberation of a death train deep in the heart of Nazi Germany, brought to life by the history teacher who reunited hundreds of Holocaust survivors of this train and their children with the actual American soldiers who saved them! THE HOLOCAUST was a watershed event in history. In this book, award winning author Matthew Rozell reconstructs a lost chapter–the liberation of a ‘death train’ deep in the heart of Nazi Germany in the closing days of the World War II. Drawing on never-before published eye-witness accounts, survivor testimony and memoirs, and wartime reports and letters, Rozell brings to life the incredible true stories behind the iconic 1945 liberation photographs taken by the soldiers who were there. He weaves together a chronology of the Holocaust as it unfolds across Europe, and goes back to literally retrace the steps of the survivors and the American soldiers who freed them. Rozell’s work results in joyful reunions on three continents, seven decades later. He offers his unique perspective on the lessons of the Holocaust for future generations, and the impact that one person, a teacher, can make. Watch the short ABC WORLD NEWS PERSON OF THE WEEK clip below. And think about what it all means. MATTHEW ROZELL is an award-winning history teacher, author, blogger and speaker. He has been featured as the ABC World News ‘Person of the Week’ and has had his work filmed for CBS News, NBC Learn, the Israeli Broadcast Authority, the New York State United Teachers, and the United States Holocaust Memorial Museum. Most recently, he is the recipient of the New York State Education Department’s Yavner Teaching Award for Distinguished Contributions to Teaching the Holocaust and Human Rights. -73 photographs and illustrations, many never before published. CLICK HERE for author newsletter! Can you even imagine what unfolds as liberating soldiers and the children they saved from death re-meet each other after 65, 70 years? The old GIs uniting with the ACTUAL people they saved, two generations on? PLEASE CONSIDER SHARING THIS PAGE AT THE FACEBOOK LINK (or other social media) AT THE BOTTOM! Thanks for your interest in getting the word out, and keeping the history alive! I knew that this story sounded familiar. This train contained many Jews who had foreign passports were saved by the Germans because they might be useful in the future. I knew one of them, He became a doctor and took care of my children. His story is written in “The Boy,a Holocaust Story, written by Dan Porat published by Hill and Wang, a division of Farrar, Straus and Giroux. Amazing story we must never forget and keep what happened alive for others to ear. My Cousin, Leo Bretholtz, who passed away Two days after his 93rd. birthday, he and my father Herbert Fishman were First Cousins; was a Holocaust survivor, I miss him almost as much as his grown children, in order of birth, Myron, Denise and Edie do. Mrs. Marsha Himelfarb. Leo wrote a book about his experiences Leap into Darkness. My Dad was an American POW liberated in April, 1945. Nearly dead at the time, he recovered and went on to marry, raise 11 children, and live to see his 97th birthday. So thankful for your work. We must never forget. Margaret, God bless your father for his service for our country. So thankful he lived to a wonderful age of 97. Hi. Do you know the name of the woman in the first picture, who is holding the little girls hand as they are walking toward the camera? She looks incredibly like my grandmother. Wondering if it could be one of her lost sisters. Do you know how I can find a copy of the manifest list? Thanks! There has been speculation but nothing confirmed. If she was in the exchange camp at Bergen Belsen, she may have been on the train.For the manifest list, just click on the appropriate tab at the top. Note however that it is a work in progress as the SS destroyed as many of the records as they could before Bergen Belsen was liberated. My grandmothers maiden name was Peznik. I forwarded the picture to my father today and he compared it to his mothers wedding picture that had her sisters in it. He said it gave him chills. My grandmother was certain all her sisters had perished, so that is what my father had always thought. Of course we have no way of knowing if this woman is actually one of the sisters. Even if we could find her name it would most likely be her married name on the list, so that would still not help. Still, such a strange thing to see someone who is so incredibly familiar. Thanks so much! Poland? Hungary? Do you know any of the history up to her disappearance from family history? Do you have the full name of the sister? Wow! I came across this pic today on Facebook…Looks just like ME! Very earie feeling! I’d love to know her name. I checked with my father, and he does not have the names of any of the sisters. No other living relatives who would know either. Guess its an unsolvable mystery. If he somehow finds more information I will update here. Thanks again for your replies. Best wishes in all your endeavors. I absolutely love this wish I can be apart of such a event and bear the fading real heroic stories of history that was made. We will never forget. For years we will share stories and talk about this. Your work is amazing and to bring people together is absolutely wonderful. I will continue to share! God Bless! Unbelievable and amazing account. It made me feel good and close to my late father who fought WW2 and was captured and sent along his French Canadian to Stalag for 4 years. These young soldiers understood life at stake. Let us hope this type of horror will never come back. Thank you for keeping history alive. Peace and health on you. Thank you for what you are doing. I have studied the Holocaust since I was ten years old. I’m 58 now. A man I thought was my grandfather was a survivor. I knew him as Eugene Hertz. I think he was romanian, but I don’t remember. The things he told a 10 yr old were probably just generalities. When he died, I vowed to learn everything I could about this era. He wasn’t my grandfather; he was my grandmother’s best friend. They took care of each other. I don’t know if Hertz was his legal name or whether he shortened it when he came to America. He was the single greatest influence on my life. What you’re doing is amazing and I thank you for it! My grandfather was there with the U.S. Army and liberated at least one concentration camp that I know of…I will have to ask my mother for more if the details about his time there. He passed away from cancer before I was born but I am and will always be proud that I am his granddaughter. Now through your book I can get a closer look into what happened back then and maybe a better understanding of what my grandfather and many others went through. I apologize if I missed it in the article, but were these survivors on the train headed from their respective hometowns *to* the concentration camps – or were they already in the camps? These people like so many were likely to come from ghettos and transit camps where they were kept until as article describes when their number comes up in the roll call. Some ghettos often used to send women, elderly and the infirm first onto the camps and then kept the able behind to work, but as you can imagine as the Germans wanted to clear out and destroy the original ghettos they started sending them in waves. Actually, when it comes to this situation at hand, it is quite a bit more complicated. The short answer is they were already in the exchange camp at Bergen-Belsen, and were being transported to another camp, Theresienstadt in Czechoslovakia, when they were liberated. Since the chaos of the closing days of WW2 made arrival impossible, they were set to be murdered, but the Americans overrunning the train prevented this. All explained in my forthcoming book. Thanks for stopping by. This is so very touching. I was in USAF and sent to Furstenbruck AFB near Munich and Dachau, the infamous first Nazi Concentration camp for Political enemies of Hitler.,Later was turned into a Nazi Hell hole for the Jews. This in early 1952 and the stench and the camp was essentially same as during its massacres of these poor people. I will never forget that place and have thought of it many times since, and now 86 yrs old. It is burned in my memory. I’m from Germany (so please excuse my language or mistakes). Everything I read or see about this horror scenario of our German history makes me feel so sad and guilty, although I wasn’t even born at that time (I was born in 1971). My grandfather was a german soldier who had to go to war aged 19, without any alternative. He had to fight in Russia for so many years, hardest circumstances, and only survived because of his desertion at the last moment. It is so important not to forget, but to remember what happened during that days. My son, aged 10, will not be able to meet any contemporary witnesses anymore and it will be my turn to teach him all aspects of that cruel war and the Holocaust. I’m thankful for everyone who takes his time to account for this past.Thanks! of Waremme Belgium where I was found by a farmer who later turned me over to a Fransiscan priest who cared and protected me until the end of the war. My father was in this war also, taken prisoner at the Battle of the Bulge. Suffered much. Came home had five children, but led a hard life after. Alcohol was his downfall at 49 years old. I do however feel he deserves respect for the price he paid as a POW. your book and thought your talk would be perfect for our program., A Train Near Magdeburg. We will like to invite you to speak at our program. If that date is not possible we often have special Holocaust programs during the year and would make special arrangements if you are interested in coming to speak at our temple.. I am on the Yom Hashoah Committee and also do Holocaust programs at local libraries . We are in Orange County, New York. Linda Dubin, Adult Ed Chair Temple Sinai .You can contact me ,eldubin@optonline.net , or call Temple Sinai at 845-343-1861 M-F 9:30Am to 5PM. Thank you and please let me know what you think of the proposal, when your committee meets. My father was a WWII US infantryman with the 79th Division, 314th inf., Co. C.They were in heavy fighting in many of the areas the 743rd tank battalion were in. He was captured in Nov. 1944 and was held as a POW until April 14, 1945, a day after the liberation of the train. He was nearly starved to death in the camp and suffered many of the indignities suffered by others in the death camps. He was hospitalized and had to be carefully re-fed to keep him from dying from too much food too soon when finally liberated. I am wondering if you have explored any of the information on the POW camps? He passed away in 2001 at the age of 81 and so cannot tell me many of the things I now wonder about. I know he nearly froze to death as well and had little clothing to protect him from the fierce winter. I had not read of the massacre of the 150 American POWs by SS before I read your book. I shuddered to think what could have happened to my father. My father-in-law also was there through the same time and suffered a severe wound to his feet from a tree burst shell in the Ardennes Forest around the Battle of the Bulge, Interestingly enough, my father-in-law was shipped home to recover right after that and was married to my mother-in-law the exact day my father was being liberated from POW camp in Germany on April 14, 1945. If you have information about the POW camps, I would love hear from you. WWII is fading from the national memory and I worry that it is being forgotten. I am a nursing instructor in an associate degree program and discovered my students couldn’t even tell me what decade WWII occurred within and what countries were involved. It upset me, to say the least! Thanks for writing to me, Matthew Rozell. Thank you for your response, Matthew. I have left a review of the book on Amazon. Your work is very important and we must not let this story become lost to present day Americans. I am also reading about the work of Father Desbois, the French priest who has been documenting The Holocaust by Bullets, the mass slaughter by the “einsatzgruppen'”, or mobile death squads. These German soldiers went to towns and villages, marched Jews and Gypsies out to ravines or pits and slaughtered them along the edge, covering them up. Some of the people were buried alive. He estimates at least 1.6 million were eliminated in this manner. He has been doing this since 2004. He wants to make sure these people are honored and shown the respect they deserve and not forgotten. People still alive who remember these horrendous acts are giving eye witness accounts of the horrors. As with your research, the people who were there are aging and rapidly disappearing from the scene. Thanks to people like you and Father Desbois, the world is reminded about the things that happened a mere 71 years ago. In the grand scheme of history, that was but a moment ago. That is what I find so scary, that recent history is being forgotten, not taught in schools, and not regarded in the way my generation did. Please keep up your work. We need people like you! Hello everyone, in response to Robin, my papa was also in the POW camps for four years, having been caught in the Dieppe battle. One of them where he was the longest was Stalag 8b in Lamsdorf. I found an amazing Facebook site dedicated to that camp which had many nationalities. There are other stalags but maybe this could start you in the right direction. At least, there are common denominators of life of the soldiers in the camp. Best of luck! 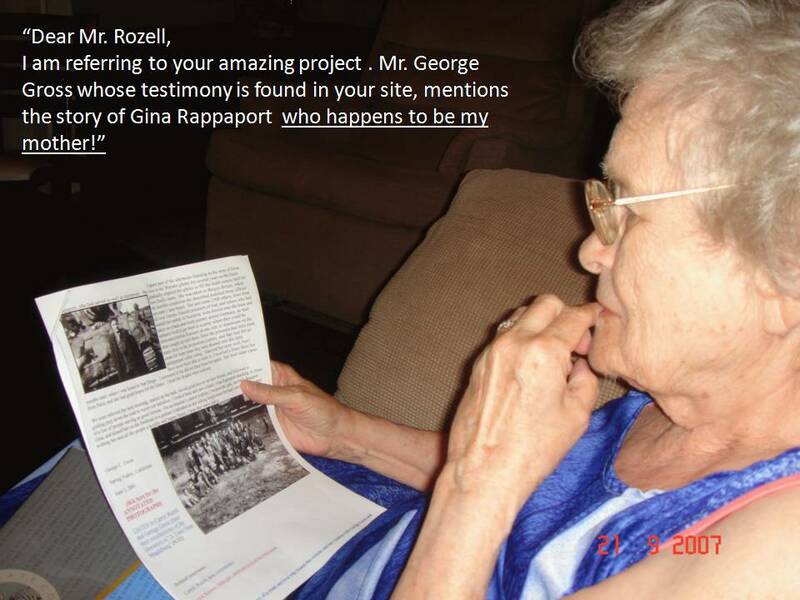 Hi Matthew Rozell, my name is Shy’Ann I am a high school student and currently learning about The Holocaust. I have never knew about The Holocaust until one week ago. When my teacher had started to tell us what happen, and showed us pictures of the deaths of The Holocaust I couldn’t believe it I did not want to. I was sad seeing the pictures and information like any other person would have until it truly hit a nerve were I started to cry, When I saw a video in class today of Gerda Weissmann Klein. She had told her story and it madde me never want to complain again about my life. It was heart breaking to hear it, to see the pictures, but nothing will ever be compare to what they went through. I have not known what The WWII or The Holocaust was fully about until one week ago and still learning it, and I thank you to all the survivors, the soldiers, and my English teacher for telling me the history of the past. My name is Shy’Ann and I will never forget this tragedy of history. Thank you Leslie, I am glad that you got to know Frank. Such a bad time but so many miracles. And yet, read my book. maybe you will have a glimmer of hope. I did a lot more than run around and push a microphone in front of young people’s faces. Of course it is not their fault, but despite her ‘disclaimers’, she also exploits. State ‘mandates’ mean little. And yet, some of us do combat, in the classroom. You would have never seen this photo if that was not the case. Thanks for your comment . Wow Great books. I am on the train book. Amazing stories!!! I am embarrassed to say I never knew the size and the magnitude of the Holocaust. So frightening and a breathtaking book. It upset me that much I could only read a few pages at a time. How this happened is unbelievable. Do we learn from it…….yes……never ever again. Thank you for this book. My grandfather, Elliot Benadon, and his parents, David and Esther are on the manifest list that is published in the book. Unfortunately, my grandfather passed way about ten years ago, but I want to keep his memory alive. By any chance, do you have documents, photos, or any resources in general for me to look through? My great-grandfather, Dr. David Benadon was apparently well known in Bergen-Belsen because of his profession. I would be so grateful if you have any information, or source of information, that I could look through.